Team GB athlete and Rockstar, Aly Dixon, reviews a successful summer for her both on and off the track. The first part of 2013 was spent focusing on the Brighton Marathon, where I was hoping to run under 2.31 to stake a place on the GB Team for this summer’s World Championships. Training and focus races went really well, including running a big PB of 1.11.20 at the Bath Half Marathon in early March. The Brighton Marathon was a success (I was the 2nd woman home and recorded a near 4 minute PB), but the fact that I was 8 seconds outside 2.31 meant that a trip to the Worlds wasn’t to be. After a 2 week rest, I headed out to Font Romeu for 3 weeks altitude training. I was hoping that this would double as a bit of warm weather training, but the weather gods had other ideas and sent us a lot of snow (not ideal, but it did make the surrounding mountains look even more stunning). 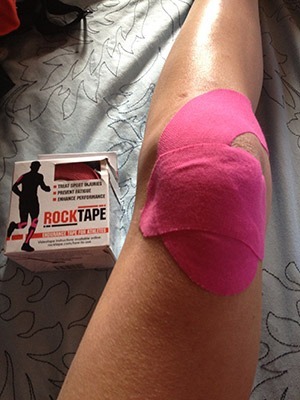 When getting back into a training routine after a marathon, you always find lots of little niggles, so my supply of Rocktape got a good bashing. 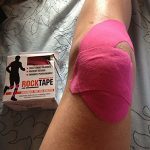 I had been using Rocktape during marathon training to support muscles and tendons when tired and to help maximise the endurance of muscles during long, hard runs. I find that Rocktape Is brilliant for this and looks a bit more funky than compression socks. The bright coloured tape strapped round my legs always draws plenty of comments at work and we find that we actually sell more of it in the shop when I am wearing it. Whilst out in Font Romeu I received a phone call to say that I had been selected to represent GB at the European Cup 10,000m Championships to be held in Bulgaria in early June. This was my first ever GB vest for a track event, something I never thought would happen as track is not my favourite race surface and I have managed to avoid it for a number of years now. Before travelling to Bulgaria I ran my first track 5,000m since 2008 and very happily recorded a PB of 16.00.01 (a massive 22 second improvement, but so agonisingly close to breaking the 16 minute barrier that I swore to do a Colin Jackson style dip at the finish next time I raced). Over in Bulgaria we were greeted with temperatures in the mid to high 20’s and racing at 5.30pm in these conditions wasn’t conducive to fast time. All thoughts of challenging for a qualifying time for next year’s Commonwealth Games (33.05) went out of the window and I just concentrated on running the best I could and helping the team to place as high as possible. As a team, we ended up 2nd behind a strong Spanish trio and, individually, I was 11th. My time wasn’t the fastest ever, at 34.03, but it was a track PB, so I can’t really complain, especially having my first ever international medal hung around my neck. After Bulgaria I ran another track 5,000m and recorded another PB (15.53 – finally breaking through the 16 minute barrier). I followed this up with a few local road races and then headed to Birmingham for the UK Championships and World Trials. 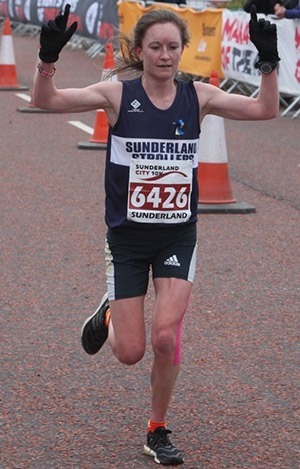 To cut a long story short, I was eventually crowned UK and English 10,000m Champion 2013 after being allowed to run with the men on the Friday night rather than at the original time of Saturday evening (I got told of this change whilst on my way to Birmingham on the Friday afternoon). 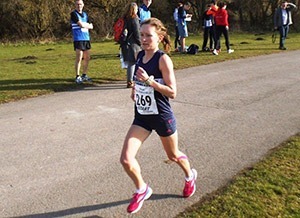 I finished my season with a win at the North Eastern 5km Road Championships, recording yet another PB of 15.52. 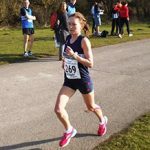 This time not only put me on top of this year’s rankings, but is the fastest 5km ran by a British female in nearly 18 months. 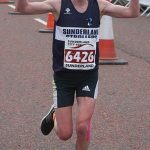 So after a few days rest I am now back into marathon training in preparation for racing the Frankfurt Marathon on October 27th. I hope to run fast enough at Frankfurt to secure selection for the England Team to compete at next year’s Commonwealth Games in Glasgow.